The World Potato Congress is the premier networking organisation for the global potato value chain. 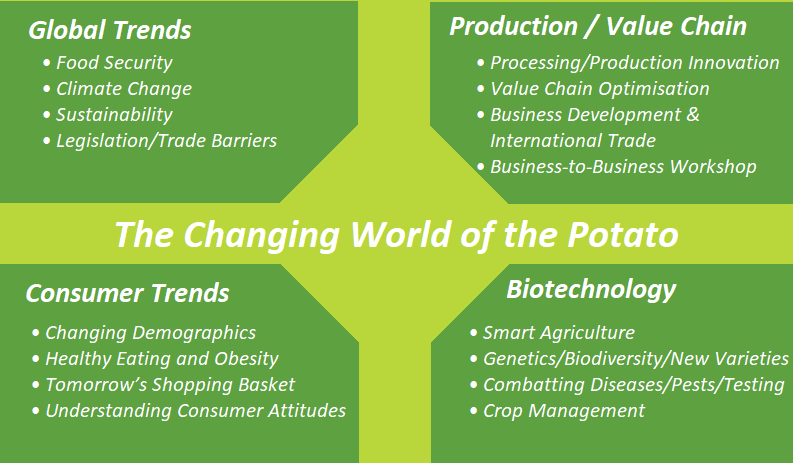 The 2021 proposed theme of “The Changing World of the Potato” reflects the dynamics of change within the food industry and how the potato industry must address the challenges and opportunities at hand. The Congress will provide an excellent opportunity for the potato industry to network, make new business connections, engage with the global audience and secure contracts whilst attending WPC 2021. The central focus of the exhibition space will ensure maximum footfall and engagement of the delegates. Our meeting spaces are located off the exhibition hall with catering, seating, networking and business meeting spaces, all centrally positioned to maximise engagement with our supporting partners. Focus on Why You Should be at WPC 2021? An example of some of the preliminary areas covered at WPC2021. We welcome an opportunity to discuss and create a unique package to suit your needs at the congress.